Now retired, Dr Baxter is a former Principal of St John’s Theological College, Nottingham, and a former Chair of the Church of England’s General Synod’s House of Laity. 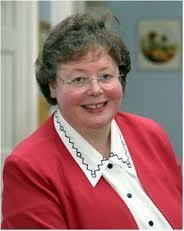 She has been a Reader since 1971 and is a lay canon of Southwell. As the conference theologian, Dr Baxter will introduce and reflect on the themes of each session. You’ve been a Reader for more than 40 years, run a theological college, chaired the House of Laity in the Church of England and are a Canon. You seem to have done everything a lay person can do in the Church – have you ever considered ordination? I think that you need to be called to be ordained, and I have never had that call, although I have been open to it. But as time passed, it seemed as if the Lord really wanted me to stay as a lay person, and I have been very content with that. Indeed I think I may have achieved more as a lay person than I could have done as an ordained person. One of the aims of the 2020 Vision strategy is to encourage lay people to join leadership teams and play a much more active role in the church. How do you think lay people and their churches could benefit from this? Do you have any tips for motivating busy people to take on more responsibility? What has motivated you? I think it is very important for lay people to be playing their full part in the work of God, whether that is world focussed or church focussed. I also think that people will have different periods of their life, so their ministry and mission will change over their lifetime. For lay people, there is great joy in serving the Lord in the church or in the world, and the church can certainly benefit from every Christian person using their gifts and talents as part of the wider team. I think that it is good to make sure that people who are being asked to do things are helped to think about what they might ‘put down’ so they do not do more and more until they ‘crash’. I also think that for many of us, it is good to have a fixed period to which we are committed so that it does not feel as if we are going to have do things until we stagger to an early grave! And another important help would be to offer to train or mentor people, to work alongside them so that they begin any new task feeling supported. I think that the Lord has been kind enough to motivate me – by showing me the urgency of the mission task to which the church is committed. I have had heaps of encouragement from people around. I have seen the Lord at work – which has been such a privilege. Another aim of the 2020 Vision strategy is to engage more young people in church. What do you think has put them off in the past and how do you think we can sow the seeds of faith in people growing up in today’s secular environment? I may be too old to answer this question, you should perhaps ask the people who are working full time with young people. The church needs to be thinking about how it can engage whole families in exploring faith and enable children to find faith – so that they grow into it. It is hard to start when people have already made their minds up about faith. But the church needs to employ people who are willing to meet young people where they are. And they need to support them with their prayers and to be willing to be part of teams who work together to enable faith to be explored. Our work with young people may have to be outside of the church in the first instance as we cannot expect people who have no church connections to come into our place and cope with our set ways of doing things. I am really pleased to be involved with Bible Reading Fellowship, which has started the ‘Messy Church’ work, and has now launched ‘Who let the Dads out?’ We are not short of ideas of how to engage with young people but we may be very short of intercessors and people who will give a few hours each week to this work, or give a few pounds each week to employ someone who can work with this age group. What was your first experience of church and what made you stay? I was taken to church as a child, baptised as a baby, and made my own decision to follow Jesus when I was 15. I guess it was the living faith which grew out of an encounter with the Risen Lord which made me stay. I did not always enjoy it, but I did enjoy good fellowship with other young people and had much encouragement from a curate and his wife when I was exploring what the Lord was asking me to do with my life. What were your most frustrating and most exhilarating times as a member of the General Synod? Most frustrating – the first synod I attended turned down women in ministry, but it was the tone of the debate more than the decision which I found deeply shocking. It was at that point that I started spending whole days in prayer for Synod and with others who joined in that intercession I believe we saw the Lord change the tone of the meetings significantly. Most exhilarating was when we heard from people about the way that their faith was living, or when someone shared something which was deeply significant for them in the course of the debate. It was exciting to see the Church of England move into mission mode over the 25 years I was on Synod, and although there is still more to do there, I think we really did change the ‘ethos’ of the Church in a most exciting way. What do you think is the biggest challenge facing churches today – either on parish level or nationally? Without a doubt the biggest challenge is that we are engaged in a spiritual battle and most of the time Christians seem to be gloriously ignorant of that aspect of faith. It is a spiritual issue when we come to order our priorities, to decide about how we shall give, or to consider where we will put our energies as a church. But we often think too much as if we were working in an ordinary business and ignore much of what the New Testament has to say about this. How do you see the future of the Anglican church in the UK? Well, Anglicans have always believed that we exist while the Lord has use for us, but acknowledged that we have a call to collaborate with all other Christian people which may mean that at some time in the future we become one with them. So I want to work hard to enable Anglicanism to be all that the Lord has called us to be, but not in a way which implies that we will necessarily exist for ever. But while we are Anglicans, I think we have a special call to minister to all the people in parishes, chaplaincies and in networks –wherever people live or work or take their leisure. We do that with other Christian people, but often we may be the only Christian presence in a place and that gives us an immense responsibility to make the gospel known and to help Christian values be expressed in every part of society. All the parables of Jesus which speak of growth are important here – we should be praying and working for growth in commitment and spiritual maturity and in numbers and service. Where do you worship and what’s your favourite service? I worship in two little parishes where the Bishop asked me to go in 1985 as a Reader. I have learned over the years to be able to worship wherever I am, so I do not have a favourite service. I do try to receive Holy Communion twice a week as it is very important to me, but so too is a prayer meeting or a Bible Study, or an informal family worship service When I pray at home I use the Book of Common Prayer most of the time and I love the language and the shape of those services, but I know that they do not help everyone to meet the Lord! What interests or hobbies do you have outside of church life/ theology? I love gardening, and I was given a greenhouse when I retired so it has been fun to find out how to use it! And I go swimming very regularly – and I very much hope there will be a swimming pool in heaven even if there is no sea! I enjoy concerts and theatre, and people. I follow current events and politics quite closely though I am not a member of a political party – too many ideas of my own! I sew, knit and do crochet. I do quite a lot of cooking – though it is not refined or beautiful, it is usually very tasty. I have painted some of the outside of the house where I can reach it! I like walking and always enjoy going overseas – especially when I am going to meet other Christians rather than just going on a sightseeing holiday. I don’t have a television, so I have lots of time to spend in these kinds of ways. The Church relies heavily on the experience, talent and commitment of people who have retired and we are enormously privileged to include you in that group for this event. How else are you spending your retirement? Are you enjoying it? I am enjoying retirement enormously. I am still not quite over the feeling that I have been ‘let out of school’ and when I have a whole day free midweek, it still feels very special. My first two years of retirement have included a lot of catch up with things that have been waiting for 15 years while I was principal. I have had a lot of work done in the house and thrown tons of stuff out and taken bags of things to the Charity Shop. Even now I have heaps I need to sort through! It is great to read a theology book (or a novel) from start to finish (and not just skip read theology to prepare for a lecture). Best of all is not to have get up early to go to Chapel at 8am – and to be able to ponder what I will do first in this day – when I do not have meetings and can please myself. In the summer it is sheer luxury to be able to go into the garden and pick raspberries for breakfast – with no rush to work or worry about getting juice on clothes!